The official staff car of the Chief of Army Staff, Lt Gen Tukur Buratai, has been involved in an auto crash in the Jere area of Kaduna State. Our correspondent learnt that crash occurred on Sunday at about 6pm when a lone civilian vehicle veered off its lane and rammed into the staff car. 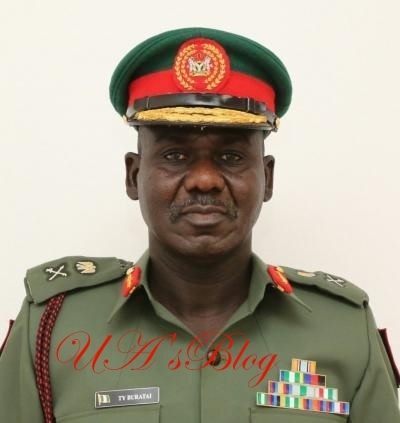 According to the army which confirmed the incident on its Twitter page, although the Chief of Army Staff was not in the vehicle, his aide-de-camp sustained injuries from the accident. The ADC, whose name was not disclosed, has been rushed to a nearby hospital for medical attention. The army said on its Twitter, “The COAS’ official car had an accident at Jere on the way to Kaduna State on Sunday at about 6pm. The staff car was in a convoy along with other vehicles when a lone civilian vehicle veered off its lane and rammed into the staff car.